Some of us have been going to Haiti since 1999. At first it was to find Canada's most famous ship lost there in 1946, THE BLUENOSE. Since that time we have made good friends with many Haitians who just need some help to improve their lives. A people who are willing to work at improving the standard of living around them. A people who we have now worked with on a variety of projects that are on going and improving every year. Our efforts are for the long term and will be going on decades from now. With many people involved we are proud of our success with efforts that are making a difference. With your help much more can be done. We do not believe in charity that turns a society into holding their hands out. We do believe in handing out tools, supplies, and knowledge that will sort out problems and build for the future. We believe in raising funds and aid to provide jobs, better schools, medicines for clinics or hospitals, and for kids to get a better education. Over the years we have built over 100 water cisterns that we supplied the materials and the funds for wages for Haitians to do the work that we trained them for. Over the years we have built 6 fish farms now raising fish to supply protein to many on the island. The fish stocks in the area have collapsed and without this new venture many would be going hungry. Much more can be done and is being planned. The local population are more than willing to get involved. Our efforts are through the combined talents from people from Canada, the USA, and even from countries in the EU. 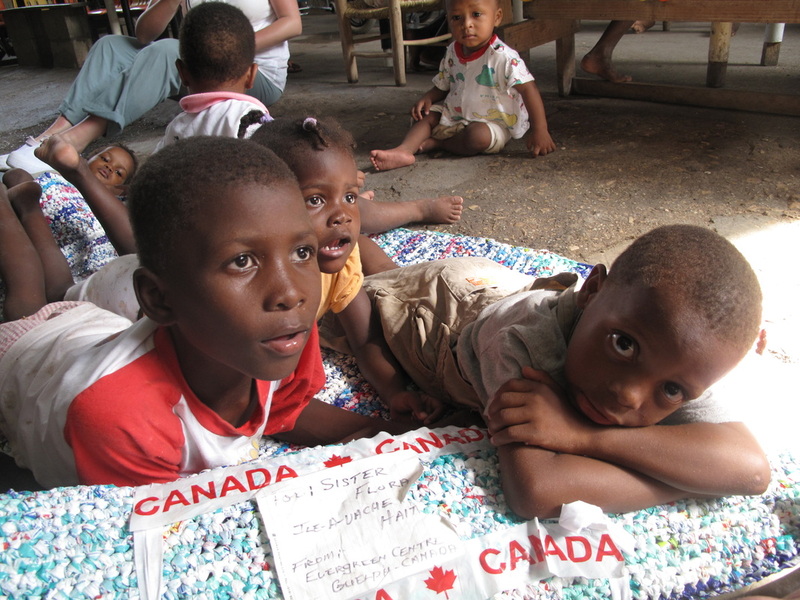 The people of Canada are our major contributor with a federally approved charity FRIENDS OF ILE A VACHE HAITI, registered with the Canadian Federal Government. We also do work with charities from the USA on mutual projects. The spirit of these efforts are brought forth from sailboats sailing in from North America at least once a year to see how our projects are doing. When we are absent from Haiti we work closely with local residents who keep things operating smoothly for all interested parties. Just like the team spirit on board a sailboat at sea our projects move along providing hope for a better future for many Haitians. Haiti - Let's Look at the Positives and build on them too. As the setting sun glows brightly over the distant mountains I find it hard to move. How can one leave this land of so much beauty. The crystal blue magenta waters. The pure bone coloured sand with shells of all colours. Not one bit of trash littering the beaches. No one around to disturb the peace and tranquility at an island few come to visit. Yet all the world hears of are the negatives, all the troubles of a people struggling for freedom once again. A people used to struggling. A people who have stood up against great odds before and won. A people if the world understood would be proud of. Yes they need help and lots of it. But let's look at the positives too. Haiti is not what it appears to be on the surface. It is full of many colours and many moods. It is a kaleidoscope of hopes and dreams that where thrust upon a people stolen from their homeland not that long ago. It is a nation who even thru all the poor standards of education, all the broken promises, has much charisma and determination. It is a nation where the locals and the missionaries alike find much fulfillment in a lifestyle that many of the rest in the world would envy. No, it is not all bad news in Haiti. There are many life and death struggles and many need your help but it is not all bad news. With your help things can be changed and many can be helped. Aid does get to where it is needed. There are many good people doing the right thing here. The island village I visit almost every year, has no electricity, no running water, no roads, no signs, no tall buildings and a real sense of community. The village wakes at 5 am with the children getting ready for a 2 hour walk one way over hills and dales to schools miles away. The fishermen organize their homemade skiffs and dugout canoes for another day at sea trying to bring in a catch. Women are on the paths by 9 am carrying 5-gallon pails on their head full of water for clothes that will be washed at a local spring. The farmers are out on their small plots tending corn, melon, banana, and many other fruits. A tempo of people that has not changed in 500 years. A tempo where a sandy path to the beautiful beach is just another road for many. Yes the island has its problems but so does that so called civilized world. Yes much has been accomplished in turning these problems around. With some proper government, some proper schooling things can greatly change again. It is a nation that needs a hand up and no handouts for the handouts just ruin the determination to make their own way in this world. Haiti was the richest nation in the New World for over 150 years. It was where the Western World began. It was considered the most beautiful island in the Caribbean. The local populace fought against slavery and won their freedom in 1804 making it the first black republic. To win this freedom they even beat back the armies of Napoleon. Yes they have struggled with their freedom and much yet has to be sorted out but against all odds the next chapter for the island will be one of living the freedom they won. Now it is a freedom from poverty and that is a vicious struggle that so many feel everyday. Things never seem to turn around fast enough before the next disaster happens. But there is progress. The next time you hear another negative news report just remember this short story. There are corners of Haiti where it is a paradise. The swaying palms, balmy breezes, rich clear sunny days full of lots of sunshine, fresh fruits and most of all the maritime scenery is simply breathtaking. I have met many people here who I trust and respect. Hardworking people who care for one another and try to make it a better world. From all these good people there is hope and there is a better tomorrow. All nations have struggled with their birth; all nations have become lost and disorganized at times. With some direction from international friends Haiti too will find its way and will take its place on the world stage. They have earned it and deserve it. So your efforts in the past have made a difference and so will your help in the future. Movie - Everyone helping to sort out who gets what after the boat arrived. Mye Island. A pure white sand bar set in a warm sea. And yes that is a small Canadian flag planted in the middle.